A photograph of a tornado and two funnel clouds, taken on Thursday, August 28, 1884 by photographer F.N. Robinson of Howard is currently on display in the research room of the South Dakota State Historical Society-Archives at the Cultural Heritage Center in Pierre. The photograph will be on display throughout the summer. The State Archives is open 9 a.m.-4:30 p.m. CDT Monday through Friday and the first Saturday of most months. There is no charge to see the display. The tornado tracked 20 miles west of Howard that day around 4:30 pm. Surviving records, accounts and sketches of the tornado would today put it in the F3 to F4 range of the Fujita scale. The tornado was part of a larger outbreak of storms and tornadoes that killed at least six people and caused extensive property damage and loss of livestock in southeastern South Dakota, mainly located along the James River Valley. A detailed report of the August 1884 storm was compiled by Samuel W. Glenn of the United States Army Signal Corps titled “Report on the tornado of August 28, 1884, near Huron, Dakota.” The report featured a number of accounts of the storms, sketches of the tornadoes and notes of their destructive force. The report is available at the library of the South Dakota State Archives. Robinson took two and possibly a third image of the tornado west of Howard. The tornado was visible for an extended period of time. The more well-known image was the second one taken by Robinson and is the one shown in the photo display. The photo was slightly retouched, a common practice in the era, and sold as a postcard. Robinson applied for and received a copyright for the image through the Library of Congress. 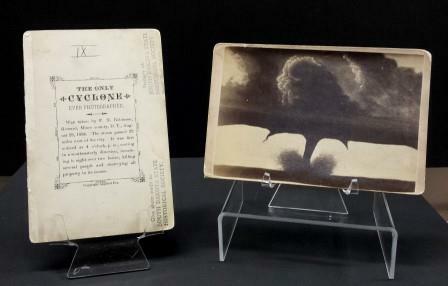 For decades, Robinson’s photograph held the distinction of being the first photograph of a tornado. An earlier photograph of a tornado does exist, however, taken by A.A. Adams near Westphalia, Kansas on April 26, 1884, three months before Robinson’s image. Robinson’s photo, being more dramatic and from a storm with fatalities, supplanted Adam’s image as the more popular tornado. In addition, 13 weather related books from the collections of the State Archives Library are also on display next to the photo display case. The books feature historical accounts of South Dakota weather related incidents such as tornados, floods and droughts.